I'm the author of several fantasy novels for children and young adults. My most recent book is ‘Seven Miles of Steel Thistles’, a collection of essays on fairy tales and folklore published by the Greystones Press. Many of the essays began life here on the blog, but since blog posts tend to be ephemeral things, often written in haste, I went back to each and every one to revise and rewrite them. So at least half of the material in the book is new. You'll find me talking about fairy brides, Japanese fox-spirits, selkies and White Ladies - taking a new look at Cinderella and the Sleeping Beauty and other fairy-tale heroines - following the fortunes of the Lost Kings of Fairyland - finding what happened when William Butler Yeats successfully summoned the Queen of the Fairies, and wondering why and in what circumstances people actually believe in fairies. I grew up in the Yorkshire Dales, and can’t remember a time when I wasn’t writing stories. I loved reading, too, and aged ten my favourite books were the seven Narnia stories by C.S. Lewis. When I’d finished them I was desperate to read more – so I got an old blue notebook and started writing my own Narnia book. I think this was the moment I decided I wanted to be an author when I grew up. When I was thirteen I wrote some short fantasy stories which I called ‘Mixed Magic’. My father typed them out for me (it was long before word processors and computers) and sent them to an agent, who wrote back that, though they weren’t good enough to published, I should keep writing. I did. By now my favourite books were fantasies by Alan Garner, Ursula K Le Guin and JRR Tolkien; along with historical novels by the likes of Rosemary Sutcliff and Henry Treece. Perhaps that’s why, so far, all my books have been fantasies set in the past. 'Troll Fell', 'Troll Mill' and 'Troll Blood' are set in the Viking age, while ‘Dark Angels’ (US title 'The Shadow Hunt'), is set on the Welsh border in the 12th century. 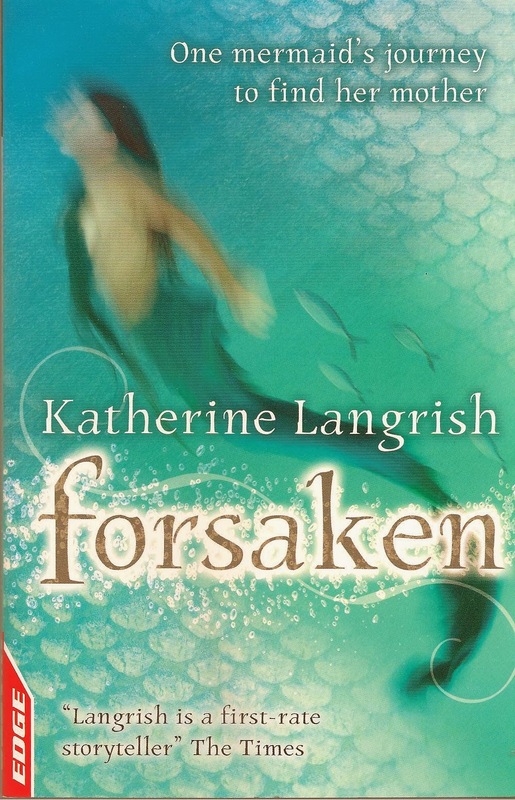 I've also written a 'short read' called 'Forsaken', based on a Scandinavian legend about a mermaid, published by Franklin Watts/EDGE. I studied English at university, got a job, got married, had children and went to live in France and then in America. During this time I was almost too busy to write – so I began visiting libraries and schools, telling stories aloud. This turned out to be excellent practice for being an author! At last I moved back to England and began writing the stories that turned into the Troll Trilogy, which was republished in one volume nder the title 'West of the Moon'. I began this blog, 'Seven Miles of Steel Thistles' - with some trepidation - in November 2009. The name comes from a phrase in an Western Irish fairytale called 'The King Who had Twelve Sons', where the hero has to ride 'over seven miles of hill on fire, and seven miles of steel thistles, and seven miles of sea.' It seemed to me to be a good metaphor for the trials of writing books - which is often very arduous - and, indeed, for life itself. 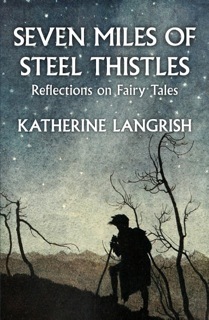 In 'Steel Thistles' I indulge my love of fairytales, folklore, fantasy, myths, legends, and children's literature. Here I am with my dog, Polly, standing in front of Silbury Hill in Wiltshire - not very far from where we live. The rainbow you can just see behind me arched right over the hill, which is a huge prehistoric mound about four and a half thousand years old, and the largest man-made mound in Europe. 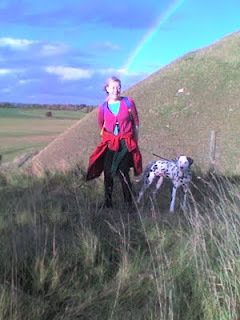 Nobody knows what it was for, but it's very close to the great stone circle of Avebury, and there are some brilliant walks around there which we - and Polly - thoroughly appreciate. Thanks for taking the trouble to find out about me and my books. If you'd like to know more about the legends, research and stories behind the books I write, you'll find plenty of details at my website www.katherinelangrish.co.uk where you can also contact me.